Enhance the wireless user experience by delivering the performance, range and reliability of 802.11ac Wave 2 wireless technology with the SonicWALL SonicWave series. Benefit from performance features such as 4x4 MU-MIMO and a 2.5 GbE port to achieve multi-gigabit performance plus a suite of security features including a third radio dedicated to security. Give your WLAN users a superior and secure wireless experience. 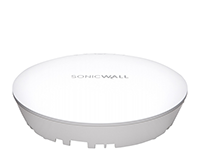 The SonicWALL SonicWave Series of high-speed wireless access points delivers the performance, range and reliability of 802.11ac Wave 2 technology. 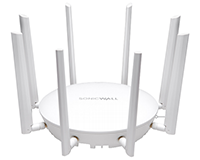 Ideal for indoor and outdoor environments, the SonicWave Series tightly integrates with SonicWALL next-generation firewalls to create a wireless network security solution that ensures wireless traffic is secured from network threats. 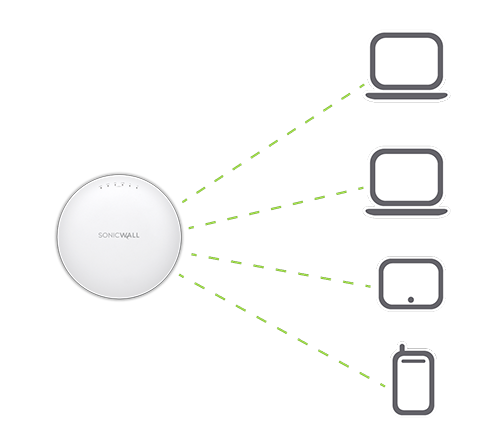 SonicWave wireless access points support the 802.11ac Wave 2 wireless standard which includes MU-MIMO (Multi-user, multiple-input, multiple-output) technology. MU-MIMO enables simultaneous transmission from the access point to multiple wireless clients instead of just one, offering best-in-class wireless performance. SonicWALL helps you plan the deployment of your SonicWave access points with wireless signal analysis tools. Utilize the visualization maps to optimize site-based placement of indoor and outdoor access points for maximum signal strength. Extend the signal coverage area of your SonicWave outdoor access points with a range of high-gain panel and sector antennas. Use 802.3at Power over Ethernet (PoE) injectors to deliver power to the access point and other PoE devices such as outdoor cameras. SonicWALL Wireless Network Security is the ideal solution for organizations of all sizes and types looking to build a secure, high-speed wireless network. Deploying SonicWave 802.11ac Wave 2 access points in combination with a SonicWALL next-generation firewall provides enterprise-class wireless performance and security for businesses, schools, hospitals and other organizations. Advanced Gateway Security Suite includes Capture Advanced Threat Protection, Gateway Security, Content Filtering and 24x7 support. 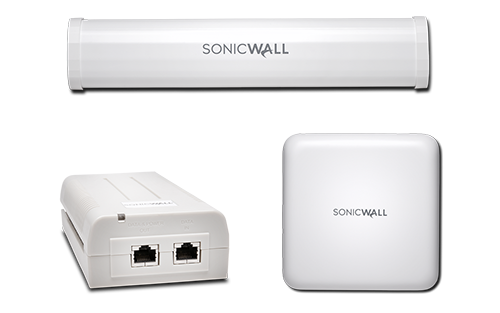 SonicWALL Wireless Network Security is perfect for small offices, such as retail businesses, school classrooms, medical/ dental businesses and banks. By combining SonicWave series wireless access points with a SonicWALL firewall, these organizations can quickly extend wireless network access while providing deep packet inspection for both wired and wireless traffic at the gateway before allowing access to sensitive resources. SonicWALL wireless guest services offers password-enforced customer access to the Internet, while virtual access points provide logical segmentation of secure wireless network traffic and in-the-clear customer access. 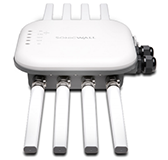 SonicWave access points provide multi-gigabit wireless performance with greater signal range and reliability. 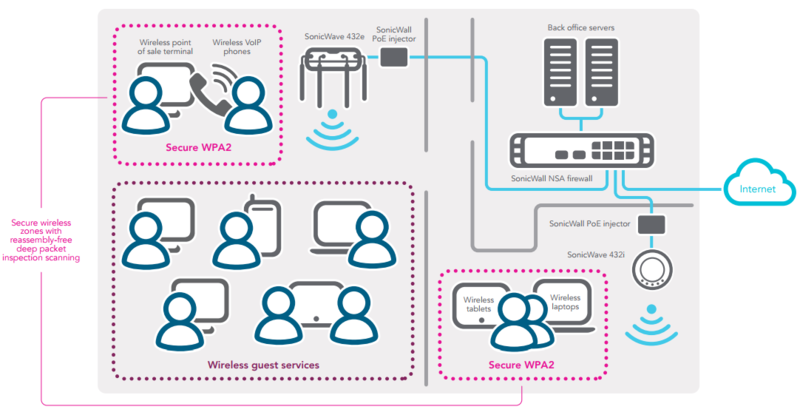 SonicWave access points are autodiscovered and auto-configured by the central management gateway, easing deployment. SonicWave access points enable employees to securely access network resources from the wireless network using SSL VPN or WPA2. Virtual access points create secure segmentation between trusted and untrusted wireless users by allowing broadcast of up to eight unique SSIDs. Deep packet inspection technology detects and eliminates vulnerabilities and threats across all inbound and outbound wireless traffic. Key security services, such as application control and content filtering, are enforced over the wired and wireless LANs. SonicWALL wireless guest services and lightweight hotspot messaging enable organizations to offer customers wireless Internet access from a customized authentication interface. SonicWave access points allow the dedication of one radio to rogue access detection while the other two support users, helping achieve and maintain regulatory compliance. In distributed network environments that have a higher density of client associations, such as businesses with remote and branch offices, college campuses, school districts and healthcare provider networks, SonicWave wireless access points with 802.11ac Wave 2 technology provide superior wireless signal performance, range and quality. Employees, students and customers can securely access network resources on the wireless network using SSL VPN or WPA2. Using SonicWALL GMS, administrators can centrally manage every SonicWALL access point across the entire network, including creating and enforcing wireless policies, which eliminates the need for a separate wireless controller and reduces the total cost of ownership. 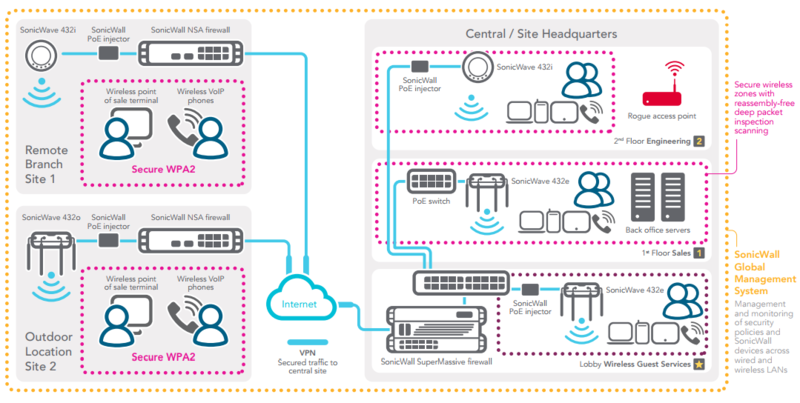 SonicWALL GMS provides central management and monitoring of the wired and wireless LANs, including the firewall and all SonicWave access points that are connected to it.